It’s interesting to see how things shake out in life sometimes. This year especially, I’ve already run the gamut on emotional health in the 5 short weeks we’ve had of 2017. I’ve been trying to be productive but the pieces aren’t fitting together. This weekend, I realized it was time to trade productivity for value and I’ll tell you what I mean by that. Maybe some of this sounds familiar; start the year on a high with the promise of a clean slate, hit the ground running, hit a road block, trip and fall, flail around trying to figure out what just happened, wallow for a bit and get back up, gingerly limping forward. I’ve been mulling over some of the events of the past few weeks; U.S. politics, my reactions, statements made by friends and family and strangers, other people’s reactions, reactions to those reactions and it’s not hard to feel out of control. It’s like we are all stuck in a loop going around and around and no one is stepping out to make it stop. The thing that both confounds and inspires me is that when I truly feel like I have very little control, I’m actually more likely to find peace in what really matters. I had an article featured on FoxNews this weekend and it got me thinking about my health journey and the ongoing process it continues to be. Health is something I keep coming back to because while I have definitely made progress in areas, I never want it to seem like I figured it out, reached the finish line and now I’m waiting for the world to catch up. Not even a little bit. Not at all. Health is very much like a garden. We plant different seeds in different seasons and harvest the benefits in due time. Sometimes we plant seeds of promise and good habits and sometimes we let our ground lay fallow and have to start over. This is a natural process and not something that should be shameful. As I grow into the skin of this lesson, I am beginning to feel so much freedom. There are many shoulda-coulda-wouldas to choke on. And after a tough January, I’m planting the seeds of my goals, to be sure. But I won’t be the on the sidelines screaming GROW GROW GROW when things don’t happen in my timing. What matters more is that I notice the small things, those tiny sprouts with their beautiful colors, and feed them little by little. Health is not a certificate or a medal on a hook to be achieved. It’s a living breathing thing that can only improve when fed. I’m learning too, that there is more than one way to feed it. I’ve spoken recently about my weight loss in 2016. Achieving that goal was almost all-consuming for me. I needed laser focus and consistency to make big progress and I had it. This isn’t to say I am giving up on that at all. However, I am at a place where it’s definitely a priority but not the only priority. When I started that journey, I was working part-time. Now I work from home full-time and I’m learning another set of rules when it comes to taking care of myself. My health isn’t just how active I am or what I eat, it’s also about how I feel mentally and spiritually. By shutting certain things off in my life I can make room for better things, say no and pave the way to a better yes (affiliate link). On Saturday, my whole family took a break from any and all screens. To be honest, we were all nervous about how the day would go down because it’s incredible how screens have infiltrated just about every aspect of modern life. We went out to eat, ran errands, spent all morning at the library and all afternoon reading. We had a great time together and what stood out to me the most was how hungry we had all been for a day like that. If you know me, you know I’ll be the first person to defend screens. I love technology and I think having an almost instinctual understanding of computers from a young age is essential in navigating future career options and life in general. We can’t escape them, so there’s no reason to fear them. That said, regular breaks are essential and as our screen-free day went on, we realized why. Not only were we spending more time together, but we had a massive break from information consumption. For me, that was huge. My mind is constantly spinning with thoughts and ideas and plans so to have that faucet turned off for a day allowed me to enjoy what was already here. This is the work-life balance that is so hard to attain at times when your life is so connected. But it is so, so good. What I keep hearing over and over this year is to let go. Let go of the overwhelming need to push forward at all costs. 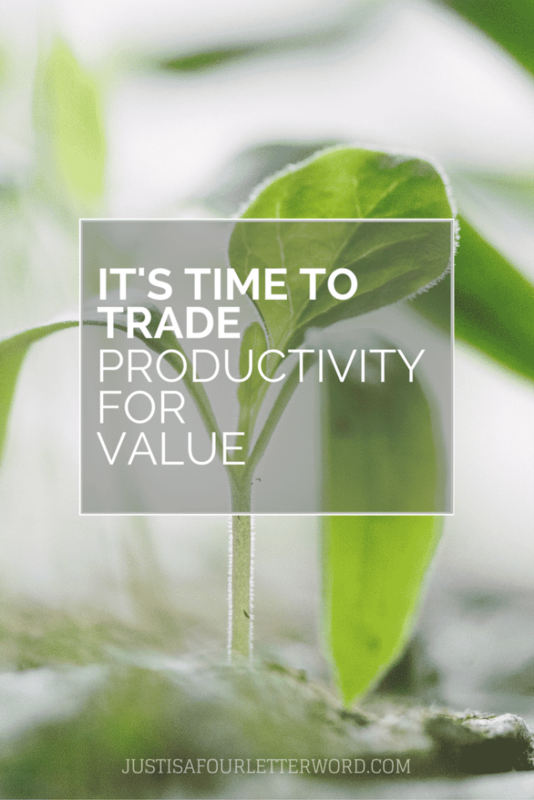 Let go of productivity and replace it with value. It’s no healthier for us to push forward and bark at our goals like drill sergeants than it is to sit and eat a dozen donuts in one afternoon. So what does that mean for month two of 2017? It means I am staying the course but slowing from a sprint to a steady pace. It means I will take each day as it comes and make some good choices like more reading, less fretting, and more hugs. Practical changes like not checking my phone until the boys are off to school and making sure I get plenty of sleep will be my goals. Walking this journey with my family, with my coworkers, and with you is who makes me the person I am. It’s all part of my life. Each day I feel my muscles relax just a bit more than yesterday into who I am created to be, whether I am in a season of sprinting, or limping or rest. It’s a good feeling and one I hope to remember the next time I forget to breathe. Maybe this is a reminder you need as well. Here we are. It’s February 2o17. Are you chasing useless productivity to stay busy? Or are there areas in your life where you could trade that striving for something more valuable? What would that look like for you? Something tells me the answer might be a breath of fresh air.